I’m sitting here writing this on the 2nd August wondering where the Summer has gone, and wondering if August will fly by just as quickly. It has been a very busy couple of months! The seas around Kishorn and the West Coast of Scotland are full of boats. Work boats, passenger ships, ferries and fishing boats. It was lovely to see the Waverley a month or two ago, a prime example of restoration and preservation at its best. She received the usual Pipe Band welcome in to Kyle, with a number of pipers and drummers in the band being from Kishorn. This year I was finally organised enough to get to the Skye Bridge to see her pass underneath (and past the cassion leg supports that were built in Kishorn!) and then get back to the pier to watch her tie up for the night. I am sure that some of you reading this took a trip on her this year! In Kishorn itself, we have regular boats that come in and out of the loch on a daily or weekly basis. The Ferguson Transport landing crafts come in and out almost daily, and we see the larger cargo boat Harvest Caroline II at least once a week. The blue and white Maursund comes in to load up building supplies for St Kilda every week, though once loaded she usually sits off Kyle until there is a weather window. The landing craft and fast-boats from the fish farm go daily out to each site and back while on the opposite site of the loch there is usually a tug or two working with the building of fish cages. The Kishorn fleet are at the moorings at Rhunasoul and it has grown this year! On the hills behind Courthill, there is a line of large trees on a clear piece of ground. These trees are called The Gallows Trees. It is thought that they were used until the 19th century when there was a court of justice at Courthill. If you were found guilty of a crime and were sentenced to hanging, you were taken to the Gallows Trees. It is also thought that due to land boundaries, there were separate justice systems on either side of the Applecross mountains. If you committed a crime on the Kishorn side of the hills, you were able to escape from the court by climbing over the mountains to reach the safety of Applecross where you were considered innocent with your crime unknown. However, if you were caught and captured before reaching Applecross you were taken to the Gallows Trees where you were hung in sight of the ‘safety’ boundary – the trees offer a very clear view of the Applecross mountains. It certainly adds another meaning to the Gaelic for Applecross – A’ Chomraich, the sanctuary. Old maps of the area are full of Gaelic names, but what looking at old maps also does is allows you to piece things together about the history of the area. I posted on Kishorn Online recently about a stone by the side of the road near Sanachan which I assumed was a mile stone, used to measure road distance in the days before electronic technology! A resident commented to say that there was another one near Courthill. On looking at a map published in 1905, I discovered that these mile stones are marked on that map along with the distance to either Lochcarron or Shieldaig. I also discovered that the stones had been laid sometime around 1902, in preparation for this new 1905 map. There are many more marked on the map, and I intend to find as many as I can if they are still standing! I launched the new Kishorn Online website in July and there are lots more history pages for you to look at. Visit http://www.kishornonline.co.uk to find out more! Scottish Gaelic was a language that once dominated this part of Scotland and this is evident in local place names which still exist today, though many now appear on roadsigns as the English version; Air-darroch (Ardarroch – point of Darroch), Achadh na Traghad (Achintraid – field of/by the beach), Bealach na Ba (pass of the cattle) to name just a few along with some abandoned settlements such as Comasdonn and Reidhleacach. It is so important that those who live in the Highlands and Islands in particular don’t forget about the Gaelic language. The decision by Police Scotland to put Gaelic on all their vehicles was met with a lot of anger. But a language that could die-out if not encouraged should be protected and there are many ways of doing it, including putting it onto vehicles and road signs. Many of the ‘haters’ underestimate just how many people in the country are fluent or have some fluency in Gaelic. Just look at how many Gaelic schools there are now along with Gaelic being part of the English medium curriculum, which means that more and more of the younger generations will have Gaelic. You think that putting Gaelic onto police vehicles is a waste of money? Police Scotland having to foot a £5million bill for Donald Trump’s visit to Scotland is what I call a waste of money. Luckily Scotland refused and Westminster paid! I was reading an article a few weeks ago about the Royal Bank of Scotland stopping their mobile service to Barra – a trial service in case the branch on the island closes. Many reasons were given including lack of available space for the bank van on the ferry, but one of the main reasons was due to hostility against the staff. The same problem was experienced here in the area at the time of the Lochcarron bank closure. Staff were being heckled or shouted at in the street. This problem has not gone away and it is still happening, but this time to the staff of the mobile branch that comes down from Gairloch twice a week. They often get shouted at for reasons such as being ten minutes late arriving into Lochcarron, having just negotiated one of the busiest and most dangerous roads on the whole of the NC500, the Bealach na Ba. I know that many people are frustrated that we no longer have a permanent branch. But where was the campaign at the time of the closure consultation? Where were the petitions, letters and emails to councillors, MSPs and MPS? I wrote a number of them to our representatives. It’s not as if we weren’t given warning about the closure. We have been given the next best thing and those people who have ever been aggressive towards any member of the Bank of Scotland team need to take a very good hard look at themselves. They need to think about where the van has come from if it is ten minutes late. I don’t believe that enough was done in the community to stop the Lochcarron branch from closing and those who didn’t do enough can’t really complain! This aggression is unacceptable and will not be tolerated. If it continues, the bank could withdraw the service altogether for the safety of their staff. Make the most of having some sort of bank here in our local community because if we lose the mobile service, the aggressive customers must take the blame. One of the campaigns that has dominated my Twitter and Facebook feed over the past few months is the campaign to stop Highland Council closing many of the public toilets around the local area and around the NC500 in particular. With help from MSPs and MPs the council reversed their decision to close Dornie Hall toilets, to the relief of many hundreds of people. I have lost count of the number of times I have stopped to use the facilities there, usually in a rush heading South or back home. It’s also the perfect place to take a quick break, with the takeaway coffee shop being located right next door to the toilets. One toilet saved, many more to go. Public toilets are not a luxury – they are a necessity. You wouldn’t build a house with no toilet in it, would you? It shouldn’t be up to the community to keep them open, like the council are trying to suggest is the better option. Even a toilet block needs lighting, water, cleaning and repairing. It costs money and money that the council should have allocated in their budget. We are lucky that our Lochcarron toilets are not under threat, and will continue to open on a seasonal basis. Remember that the toilet block at Lochcarron Garage is open all year round, located on the hotel side of the fuel pumps. I try not to let the council spending issues take over my blog. However, it is one of the biggest issues facing us right now. Many people avoid politics and political issues, but I think that no matter what your view is you must get involved or show some interest at a local level. Do a wee bit of research into what issues certain candidates or councillors prioritise. Do you vote for the person, or for the political party they stand for? If you are not happy with the way things are run, sitting back and just moaning about it won’t change it. It helps to get the facts straight right at the beginning – for instance in Highland Council it is an Independent led administration who joined forces with other parties to make a majority. The main opposition is the SNP group. The administration has just agreed their new budget, hence the campaign to stop the closure of the toilets set out in this budget. The SNP group unusually did not produce an alterative budget this year which has put the voters in a position where it is very much a like it or lump it situation. This has offered no alternative for voters to look at before the next elections. There is no comparison available. It means that we’re stuck with a budget in which the administration councillors voted to retain their free council meals, but close public toilets and cut Community Council funding to almost non-existent levels. It angers me when blame is thrown around without proper research or knowledge. I read about someone blaming the SNP for the fact there is no new Stromeferry Bypass or Achnashellach road. Incorrect. Those roads are council roads, being part of the A890. Therefore, in theory, it should be the council that pay for it or fund funding for it. The issue lies with the roads not being trunk roads, and therefore not managed by the Scottish Government and Transport Scotland. Maybe if they were, it would be easier to find funding to replace these inadequate and unsafe stretches of road. Who is not in the administration in the council and not in charge of the budget? The SNP. Perhaps the blame lies with the Independent led council administration for not finding the money for the replacement routes. Maybe we should be starting a campaign to turn these roads into trunk roads. But with no SNP budget this year, we can’t see how much money they would have planned to spend in preparation for the replacement routes if they were the majority administration, or even see their plans to find funding. We are just a month away from the 12 week closure of the Bypass. It will be completely closed every night from 10pm until 7am the following morning. It won’t be fully open throughout the day, and road-on-rail diversion convoys will operate between certain times. The posters below can by downloaded onto your computer, smartphone or tablet. You can find more information about the closures on the website or Facebook page. The Meeting House is almost finished! It will be great to see lights on in the building again, and smoke coming out of the chimney pipe. I came across some more old photos; two of Ardarroch and another of the Kishorn Shop when the post office was still there. Spot the Selfie Box too, though now in a slightly different place! I’m hoping that it won’t be so long before I write my next blog. Despite living in this remote corner of the Highlands, there is still lots going on! Schools re-open at the end of the month, and the holidays will be over. Before you know it, the leaves will be starting to turn brown. But let’s just enjoy the last few weeks of summer… here’s to some more good weather! When many people hear the word ‘Kishorn’, they may think immediately of the Kishorn Commando’s… but I wonder how many people could actually point to it on a map. Believe it or not, you are more likely to see the smaller hamlets of Ardarroch, Achintraid and Sanachan on a map than you are ‘Kishorn’. Kishorn is the collective name for several settlements on the shores of Loch Kishorn, which has depths of up to 100 metres in some places. A perfect place to build one of the largest manmade moveable structures in the world; the Ninian Central Oil Platform. 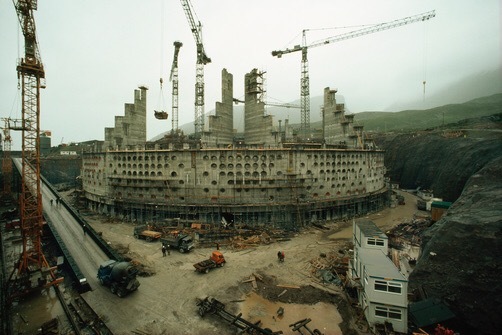 But the Kishorn drydock it was built in (which is one of the largest in Europe) was only used again once after the oil platform work dried up, for building the support cassions (the round bit that the legs sit on!) for the Skye Bridge in 1994-1995. 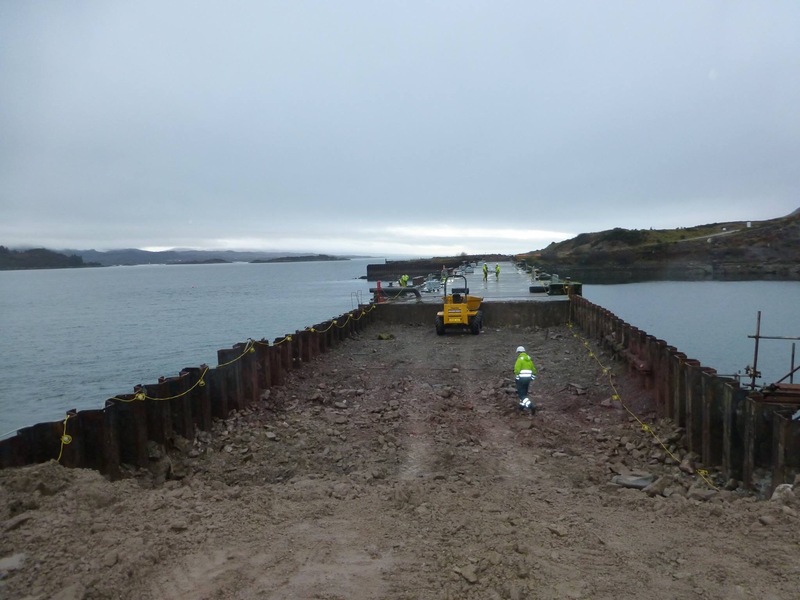 Over the past few years, Kishorn Port Ltd have been revamping the dock to make it immediately available for oil decommissioning and renewable energy work. Kishorn Port Ltd is a joint venture between Ferguson Transport & Shipping and Leiths (Quarry), who both have operational sites on either side of the drydock. The drydock is now dry, for the first time in almost 25 years. The drydock gates have undergone refurbishment with new water-tight seals in place, along with a brand new concrete access road to the dock floor. I have been following the work via the KPL facebook page, and can share the below photos with you. 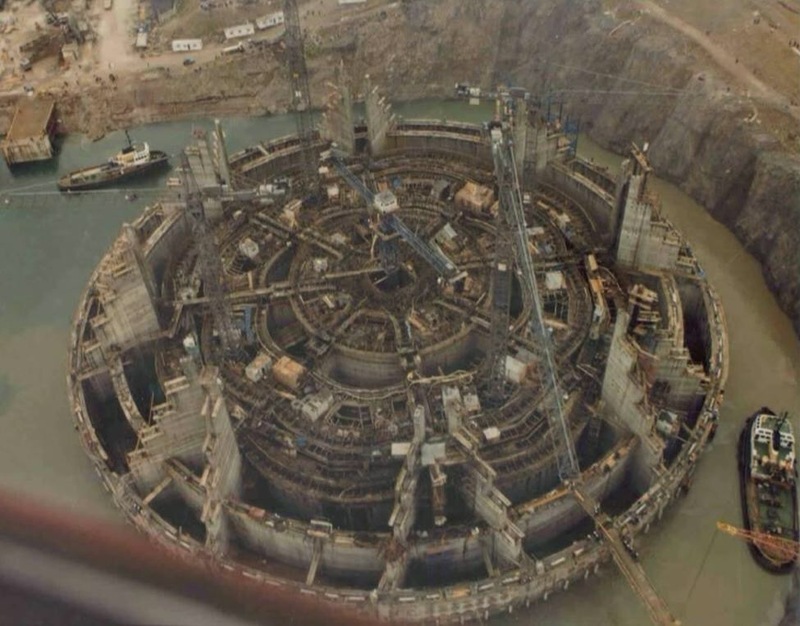 I continue to watch developments with interest, and look forward to seeing the drydock fully operational once more. It is another reason why Kishorn firmly deserves its place on the map! There are two roads to Achintraid. The first is the ‘main’ road which is signposted, located just above the Ardarroch shore. The second road is known as the ‘wee road’, or Balgy’s road, and was the original road into Achintraid. The road starts at the Kishorn sign (on the Lochcarron side) and follows the route of a burn, clinging on to the side of a small hill. It then drops back to sea level and re-joins the current ‘new’ road at Ardarroch. It follows the same route along the Dell, before detouring slightly from the ‘new’ road at An Dail. The current bridge over Abhainn Cumhang a’ Ghlinne to Achintraid is a new bridge and was built to accommodate wood trucks when major forestry works started at the end of the village. The stone supports of the old wooden bridge can be viewed further upriver. This bridge could only accommodate small vehicles and the new bridge opened up access to Achintraid. After crossing the river, the old road follows the riverbank back towards the sea, and joins the ‘new’ road again at the Achintraid 30mph signs. It is an interesting route to walk… here are some photos. It is no secret that the Highlands and Islands are facing the second round of Highland Clearances. But I don’t need more reports or articles to tell me this. This is old news and yet we are still facing the same problem. Of course things such as lack of phone signal, poor condition of roads and lack of year round work are other factors. The Highlands in particular seem to be relying more and more on the tourist industry. We welcome visitors from right across the world who come to see our landscapes and landmarks, take part in our events, and taste our food and drink. It provides a lot of employment to local people and I support the industry. But there is one question that I cannot get my head around; if we can provide housing and accommodation for all the visitors, why do we seem so unable to keep up with demand for housing for our own people? People who have local work, who want to make a life in this remote area of the country, who have started their own families here. There are many reasons why it is a struggle to house our local people. An increase in holiday homes and second homes, and private properties means that overall housing stock has decreased. Property prices have gone through the roof and it means that when a local property (or piece of land) does become available, the majority are unable to afford to buy it. Private rental properties are few and far between, which means that some of the only options available to the majority are council properties or affordable houses. Demand is there for housing, and there is a current council house waiting list of fifty-five applications in the area of Lochcarron. There have been several small and medium sized affordable housing developments with most of these houses currently occupied. I can see just how many people have been able to stay in the area and have not had to move away just to find a vacant affordable house. But for many young people in particular, including myself, I wonder what will happen in the future. Will I have the option to be able to find a house of my own, in my home community which I am desperate to remain part of? It was with delight that I heard about the Scottish Government’s commitment to building thousands of new homes. But, one of the first places to be allocated these new homes was Inverness. I don’t live in Inverness, and I do not know what potential housing problems, if any, the city is facing. But I rolled by eyes. In this community, along with the wider area, we are used to being knocked back time and time again as priority is given to the city. But as proven in Applecross (as you will see below! ), we can make our voices heard. We need to shout about our housing crisis and stop this second round of Highland Clearances before it gets any worse, and before our local populations get even smaller. Another problem we face here in this remote part of the West Highlands is investment. I thought that the £315million region deal might fix some of these problems, or at least go some way to making them smaller problems. I was proved wrong. At least, I was proved incorrect about some of the money being spent on the West Coast. The money is being spent on Inverness, around £265.5million so far. And today, on the 5th May as I write this, I read an article from Transport Scotland and the Scottish Government announcing their delight at being able to progress with the public consultations for the second Inverness Bypass. And how will it be paid for? With money from the region deal pot. I am furious, what an absolute disgrace. Another knock back for us. Our roads are a disgrace, we have been waiting for new Achnashellach and Stromeferry bypasses for years, public toilets are being closed, our bins could be collected once every three weeks due to cuts, the winter gritting was almost non existent this year due to more cuts (ah yes, because some of our machines have been taken to Inverness) – the list is endless. I intend to fight for this money because we deserve it and we have put up with being forgotten about for too long. The Kishorn Playing Field Club had a very successful first session on the Dell in April, the first session of 2018. Almost twenty children attended along with some enthusiastic parents too! We started off with some warm ups, before moving on to football dribbling skills. The group then broke into two; one played a game of football and the other played ‘Kubb’ (an ancient Viking game which can become very competitive!). We also had a fantastic turnout on the 13th May in the sun! Our next session is on Saturday 9th June (see below). The KPFC are also going to set the ball rolling for re-instating the Achintraid playpark which was removed by Highland Council a few years ago due to the equipment no longer being fit for purpose. It is a well missed meeting point for young and older children and we hope to arrange several public meetings to gauge interest and get design ideas. We will of course keep the community updated with our plans, and look out for adverts about these public meetings. A date for your diary is Saturday 9th June – we have organised a community beach clean in conjunction with the Countryside Rangers and Scottish Sea Farms. We also hope to have an evening BBQ and entertainment/outdoor ceilidh… a tug of war has also been mentioned along with some sports run by KPFC. Watch this space for further details! After reporting in the last blog post that all had gone quiet with the Stromeferry Bypass, we have an update. But not about a replacement option. From the 3rd September, the Bypass will be subject to overnight road closures to allow major works to be undertaken on the hill slope above the road. It also means that during the day the road will be diverted onto the railway line via a tramway system (which was first installed back in 2011 when the Bypass was closed for several months). Traffic will be taken through the tramway in convoy, in one direction at a time. This means that we should expect long delays for up to twelve weeks from the beginning of September, along with the overnight closures. Final details and timings will be published in due course and I will of course keep you updated. Our neighbouring community of Applecross won their campaign to stop the planned daytime closures of the Bealach na Ba in April. Instead, overnight closures will take place from the 11th June to the 21st July to allow for the continued installation of broadband cables. The pass will be closed from 6pm in the evening until 0730 the following morning. This closure will take place seven days a week. It does prove that even in our small rural communities you can still make your voices heard, even if you have to shout a wee bit louder! There has been lots of progress on the Meeting House conversion since my last blog post. All the windows have now been replaced and there are new Velux windows on the rear slope of the roof which will no doubt be letting a huge amount of natural light. There is a new wider entrance door and a small metal chimney pipe is just visible above the back slope, which means that the stove has now been fitted. The walls have also been painted and it is looking very smart! It will be good to see smoke coming out of the chimney pipe and lights on in the windows, which hopefully isn’t too far away. Under the “Dogs (Protection of Livestock) Act 1953”, farmers or crofters have the right to kill an offending dog as a last resort, when other forms of intervention have been unsuccessful. The owner or person in charge of the dog can be charged with an offence and be fined up to £1000, as well as being made to pay a compensation order. The Local Authority can also apply for an order to have an offending dog destroyed. Crofters or farmers, and also members of the public, are encouraged to contact police via 111 (connects to Kyle (or sometimes Lochcarron) police station) or 999 in an emergency to report livestock ‘worrying’. For the sake of the livestock and of your dogs, can I politely ask all dog owners in the community to make sure that their dogs are kept under control at all times when there is livestock nearby. Sheep and livestock ‘worrying’ will not be tolerated. Thank you. April and May have so far produced some very high tides and a large number of ‘good weather’ days – perfect for the KOWS (Kishorn Outdoor Water Swimmers)! Here are some photos of high tide at the beach, and also at the River Kishorn bridge at Tornapress. It is not often that the river disappears! While walking between the cattle grid at the old caravan park and the main village (Sanachan), I spotted this stone by the side of the road which I have never noticed before. This must be a mile-stone – as the name suggests, these stones were used to mark distances before the days of digital counting or google mapping! I have seen plenty of these mile-stones before, and have been told that there could be one near Courthill too which I intend to find! Now open Monday to Friday 10am to 4:30pm, Saturday 10am to 5pm, and Sunday 11am to 5pm. A very wide and large selection of paintings, books, gifts (and the all important sweets and icecream!) plus see more of Hannah’s amazing hand painted slates and stones – I am sure these will continue to be very popular! The newest business to the Kishorn portfolio! Open Tuesday to Sunday 10am to 5pm, closed Monday. Delicious home baking and scones, and very good coffee along with a wide selection of breakfast and lunchtime meals and snacks. View the gallery too next door and Tornapress Furniture. Located next to the famous ‘Bealach na Ba’ sign! It is also worth mentioning the village’s two artist studios; the Boatshed on the road to Achintraid and also Brynaport studio, located half way through Achintraid. Both are well signposted and are really worth a visit, particularly if you are looking for paintings and art of the local area and further afield. There are so many different interpretations of our beautiful landscape and it is interesting to view each painting, and see how the artist(s) have put this landscape onto paper. The landscape is one of the main selling points for people coming to the area. When living here, you can sometimes take it for granted. Sometimes I just like to sit and watch the activity on the loch, the birds singing and flying between trees, and the clouds clearing to show blue skies and let the sun through (yes, sometimes we do loose the rain!). And even though you may not see it on a map, or just intend to pass through it, stop in Kishorn for a while. Eat here, stay here. Slow down and take in the views over Loch Kishorn to the Isle of Skye. Despite being a small and remote place in the West Highlands of Scotland, there is more to Kishorn that you might think. Welcome to the first blog post of 2018… which is a bit late because it is now March! The area is beginning to open up again as we quickly approach the Easter weekend at the end of the month. You can see opening hours for our local establishments below. New to the blog is ‘History Fact of the Month’ and a few more features which I hope will become a regular addition. I feel that enough has been said for the moment about the state of our roads, and the lack of gritting, so its time for some new features and subjects. Welcome to Kishorn. The first Kishorn school, now known as the Meeting House, was built in the 1840s. The school was run and managed by the church, with the board being chaired, at one time, by the Rev Kenneth MacDonald who was minister in Applecross. He was also the school inspector and many inspections were undertaken to make sure that the pupils were showing good understanding of the bible and Christian faith along with reading and writing. One such inspection is documented below. School attendance became compulsory in 1880, though a survey undertaken in the 1890’s suggested that only around 80% of eligible children were attending school. But the Kishorn school received over 130 bibles to add to its school library at that time, which is maybe an indication of just how many children were attending the school. The first state school was built across the road from the Meeting House just before the turn of the century and the premises became vacant. However a local board of trustees was established, mostly comprising of church elders, to manage the building as a church. The Meeting House continued to be used as a church right up until around 2006. But with no toilet or kitchen facilities, the building was used less and less. It was also used as a polling station during elections, but this ceased after the 2014 Independence Referendum with the building being officially declared as ‘unfit for purpose’. It has not been used since then. But now, as of last month, work is being undertaken to convert the Meeting House into a habitable building once more and I am delighted to be able to document the conversion from start to end. You can follow these updates on the Kishorn Online website, Facebook page and also here on the blog. The Stromeferry Bypass. Need I say any more. I have not heard any updates for months. We continue to wait for the council to announce their chosen option for a replacement which will be either a new bypass through Glen Udalain, diverting from the current road between Attadale and the top of the Auchtertyre hill, or a new bridge crossing at Strome with a Lochcarron bypass. Money wise, it seems that the Glen Udalain route is cheaper and therefore I assume this will be the route chosen. If you have read the option plans carefully, you will notice that under the Glen Udalain section is a paragraph which states that to save even more money, the foundations would be laid for a double track road but only a single track road would be tarmaced. In due course and once more funds became available, the second lane would be tarmaced. By the time you put in passing places you might as well just join them all up to create the full second lane! I continue to be disappointed about the lack of support from the Scottish and UK Governments, and our local MPs and MSPs. This is a huge issue, and no help has been offered. The fact is, yes the bypass is a council road, but the council cannot replace it without help from our Governments. There has been so much “council road council problem” that I am beginning to wonder whether anything will actually happen. And if, WHEN, something does go wrong, who will take responsibility? Or will the blame be thrown around like rugby ball? Speaking of rugby and any sport for that matter, the Kishorn Playing Field Club are putting plans together for this year. We have set dates and activities this time which we hope will make it easier for people to plan to come along! We are also putting plans together for a big beach clean in conjunction with various local residents and organisations including the Countryside Rangers. The date for the diary is Saturday 9th June and it is hoped that we can also have an evening event or outdoor ceilidh with a barbecue. Keep up to date with the Dell activity sessions by going to http://www.kishornplayingfieldclub.wordpress.com and facebook.com/kishornplayingfieldclub. Information will also be posted on the various Kishorn Online pages. The power of social media has enabled us to follow the clearing of snow from the Bealach na Ba which has seen some huge snow drifts this year! The Bealach is now a priority one route for gritting which means that it is one of the first routes in the area to be gritted and cleared. But the heavy duty snow clearing machines (that are fitted to tractors) were brought in again last month and it is amazing to see before and after photos of the route. We are of course indebted to our local road teams for all their hard work in what has been a bad winter in terms of snow and ice. Monday to Friday: 9am – 4pm CLOSED. Monday to Friday: 5:30pm – 11pm CLOSED. The Bealach will remain open on Saturdays and Sundays but motorists will face delays. The closure is to allow the safe installation of a new broadband cable to the MoD base in Applecross, but I am very pleased to see reports that the cable will now be extended to properties in Applecross too. But 22 houses is not good enough, and when you have all the machines and equipment over there and road closures in place you might as well complete all the property and business connections. Hopefully more properties will soon be added to the 22. Highland Council also intend to do some road repairs and maintenance while the route is closed. Towards the end of February, Kishorn and neighbouring communities endured an evening and night of very intense thunder, lightning and hail. This caused the power to go off several times. The power was not off for long, and of course a massive thanks to engineers Donnie and Charlie for working in those horrendous conditions to get the power back on. In Kyleakin, a section of the Castle Moil castle was struck by lightning and a chunk of the old stone wall is now missing. It is always a good idea to keep an old phone (that does not run on electricity) for use during power cuts. You can phone 105 during a power cut to report it, and also to hear service information from the local electricity base. Within five minutes of the power going off, a message had been put on this phone number to inform the affected areas (listed by place name and postcode) that they were aware of the problem and that the engineers were already en-route. That is local communication at its best! It will not be long before we start to see lambs and young livestock appearing in the local fields and crofts. There is some uncertainty as to what happens if a dog in particular is seen to be chasing or attacking or hassling livestock. This is called ‘worrying’ and also covers pregnant livestock. I continue to see, in slight disbelief, that the Highland Council have progressed with plans for their random big outdoor information point shelter things, also to the surprise of many councillors! What a complete and utter waste of money when, in Lochcarron in particular, we already have a successfully iGallery and Information Point. What would we rather… Lochcarron Public Toilets open all year round or some sort of information structure? The Scottish Government in their budget announced their continued contribution to the Highlands (take ‘Highlands’ with a pinch of salt) through the Inverness City Region deal which we have not seen anything of. The Scottish Government have been too relaxed in giving a huge sum of money to the council. I believe that it should of been split by Ward area, with each council ward receiving a certain amount of money to spend on their own projects. Will we see anything of the millions given to the region? We wait in hope. Also announced in the Scottish Government budget was their plans to build 50,000 homes. I will do all I can to get as many new houses for the area as possible, in a place desperate for more housing to keep people in the area. Thank you to all the local people that have already offered their support. But it is maybe also a time to think about some sort of local trust or board that buys and renovates empty houses, and then offers them for rent on the local property market. Several schemes already exist across the Highlands and Islands and have been successful in retaining full time residents in the community. Something to think about. Currently open Fridays, Saturdays, Sundays and Mondays 10:30am – 4:30pm. Open full time from the 23rd March 10:30am – 4:30pm. Currently open Wednesdays, Thursdays and Fridays 10am – 3:30pm. Open full time from the 19th March (hours tbc). Reopens on the 20th March. Open every day (closed Mondays) 10am – 5pm. The Kishorn Online website has had a revamp with a new design and new information pages. There are new History pages which are currently under construction, but this section will make up over a quarter of the whole website. The News page is now being regularly updated. The email address remains the same, as do the Facebook and Instagram pages. Keep in touch! I would as always be very pleased to hear from you. The Selfie Box will be coming out of ‘Winter Mode’ soon and new displays will be going up. I’m planning to put the ‘History Fact of the Month’ up in the Selfie Box too. 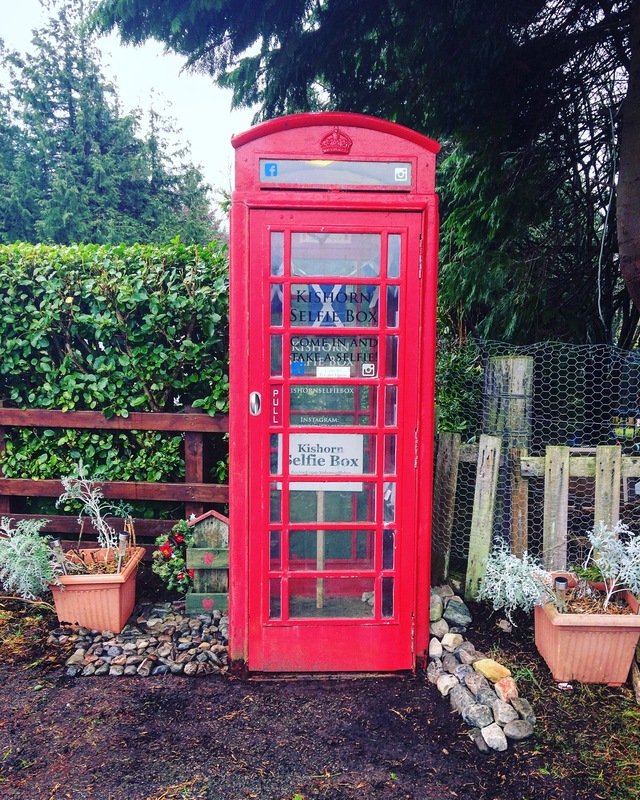 Maybe you have a red telephone box in your community that needs adopting… please get in touch because I would love to see a red Selfie Box trail. I can offer guidance and advice from our own one here in Kishorn, and set it up with the basic window & external signage and selfie cards. It does not involve a lot of work, apart from a clean and tidy every few months. But of course the BT adoption scheme means that each community can put their own spin on these iconic structures. The official start of the tourist season is just a week or two away and I’d like to wish all our local businesses the very best for the coming season. I would also like to wish you all, the readers, the best for 2018 though I know that we are now well into the new year! There are lots of exciting projects being planned for Kishorn this year, and we are of course looking forward to some Spring and Summer days with sunshine. Keep up to date with everything right here, through Kishorn Online. Not only do I document Kishorn’s past, or post about goings on in the present day, its also all about the future. The future of Kishorn. On the 20th November at 14:30, the alarm was raised on the discovery of the Applecross fishing boat ‘Varuna’ grounded on the shore. There was no-one on board. This sparked a major search involving the RNLI, coastguard, rescue helicopter and many members of the community. The search continued over a number of weeks, sometimes in challenging weather conditions. The family of Ali “Snoddy” MacLeod used his Applecross Life blog to keep the community updated on the search. His body was found on the 9th December at Staffin. My thoughts are very much with the family of Mr MacLeod, and also his home community of Applecross. I met him several times in his secondary role at the Applecross Inn, having usually just delivered his fresh catch – ready to be served to dinners in the world famous inn. Many people forget how dangerous fishing is, but also how much a part it plays in the lives of so many people on the West in particular. It really is true when they say it is one of the most dangerous jobs in the world. On Friday 15th December, many people were following the drifting of the fish feed vessel MV Fame off the coast of Harris and the subsequent attendance of both Stornoway and Leverburgh RNLI lifeboats and the emergency tug from Kirkwall. Many people were quick to criticise the ‘toxic’ cargo (is fish feed toxic..?) and what would happen if she had grounded and been holed. This is of course linked to the ongoing argument about retaining an emergency towing tug in Stornoway as well as in Kirkwall. But I would encourage anyone who criticised the MV Fame to go on a Ship AIS tracker and have a look at the number of vessels five times the size (and more!) going through the Minch everyday carrying usually crude oil. Instead of worrying about a fish feed boat, I would be worrying about these tankers and what would happen if they grounded and started leaking their cargo into our waters. Have you thought about how long it would take to bring a two hundred meter drifting tanker to a halt when the nearest suitable towing vessel could be as far away as Kirkwall in Orkney? Of course this doesn’t just apply to the Minch. Look at how many vessels pass the mouth of the loch on a daily basis, from fishing boats to submarines and the regular visitor that is the small cruise ship Hebridean Princess. Our seas are thriving, but we need adequate emergency support to be mobilised in the event of a marine emergency. Thank goodness we have many RNLI lifeboat stations and dedicated volunteers across the West, but I don’t think a lifeboat is big enough to bring a crude oil tanker under control. Speaking of very heavy snow fall, the Bealach was completely closed at the end of November for a few days while it was covered in snow. The Lochaber and Skye Police twitter account shared the photo below. Over the weekend of the 8th and 9th of December there was very heavy snowfall on the hills and even at sea level. This snowfall and also low temperatures resulted in many local roads being blocked. This was on a weekend, but there is a problem that exists during the week. School bus routes (notably Achintraid) are not being gritted before the school bus because they are not ‘priority one’ gritting routes. The priority route system needs redrawn. Now, almost every community wants their road gritted and I understand that it isn’t possible to do every single one. But is it not common sense, when it is the law that children should attend school, that school routes are cleared and gritted and made as safe as possible? You also cannot expect the bus drivers to drive down these roads in treacherous conditions. I am going to investigate what council schemes are available (if any) which allows communities to take control of their own gritting. If I had the money in my bank account to buy a quadbike or small tractor and purchase a grit spreading trailer then I would. But like many of us I don’t have that money. But, if the money can be found for such a scheme then I personally would commit to gritting the road before the school bus. Otherwise its a shovel and hand bucket… how long would that take me? On the 21st November there was another landslip on the Inverness to Kyle train line, this time just past Muir of Ord. This meant that some services were cancelled. It is a reminder of how much of a lifeline this route is, and you don’t notice it until its not there! I remember a few years ago reading a letter in the local paper suggesting that the line should be completely closed and the Stromeferry Bypass road moved onto the current line away from the rock face. Apparently the service wasn’t used enough to justify it being kept open. In the middle of the winter on the evening service, yes, the train can be very quiet. But overall each day it remains a well used service and I certainly couldn’t justify closing it down. There has been no official notification from the Highland Council about the Stromeferry Bypass but I have heard that after the latest stage in the ‘replacement journey’ it looks like a new bypass through Glen Udalain has come out on top. I’ve lost all hope of seeing work starting within five years and I just wish that the Scottish and UK Governments would commit to the project too! I have heard “council road, council problem” too many times. Enough is enough. I want the Government’s to tell us what routes can be used to get funding for the replacement option, as the Council cannot afford to fund it all. A defibrillator is being installed at the Kishorn fish farm and although it will be located at the shore base, it will be available for any medical emergency in the village. It is becoming such a vital piece of equipment to have in any area but particularly in rural communities. I will keep you updated on the final location of the defibrillator once it is installed. The village of Lochcarron now has several defibrillators, including one outside the village hall and one at the back of the Smithy Heritage Centre. It is fantastic that Kishorn and Lochcarron have them particularly with the amount of visitors and traffic that go through each village in the summer. I have seen that in parts of Skye and the mainland, there is a first responser scheme where several local residents are trained to assist with local medical emergencies. It is a scheme that seems to be very popular in rural and remote areas where a doctors surgery or hospital are not close by. I am looking forward to launching the revamped Kishorn Online website in the New Year. Although I give it a ‘freshen up’ every year along with my daily and weekly updates, I have done some new design work and made the website menus less complex and more direct. Make sure that you keep up to date with the Facebook and Instagram pages too! I always enjoy seeing your photos and hearing your views. I often look out my window and just admire the view. Sometimes I take a quick look and move on… other times I notice every crevice on the Bealach, every wave on the sea, every tree that is now bare. I forget how lucky I am not just to live in a place that has spectacular scenery and an always changing landscape, but in a place that has such a sense of community, of knowing every face. It’s a very special place, this wee west coast settlement and I look forward to returning home to it after being away, especially in the dark. Passing through Sanachan and seeing the shop sign, the light of the selfie box and the distant streetlights of Broadford as you pass the seafood bar and reach the sea again. Turning at the junction and seeing the lights of Achintraid glistening across the water… and looking forward to seeing what has changed once daylight has arrived. But although the seasons come and go, and things are built or knocked down, the Kishorn Islands still sit at the head of the loch. The tide still rises to the shingle of Achintraid beach and goes out to reveal the large expanse of flat sands. And Beinn Bhàn still looms over the settlements, with small dots of cars travelling the Bealach na Ba scattered across the slope. I would agree with anyone who says there is no place quite like home. And there is no place quite like Kishorn. I would like to wish you all a very merry Christmas and a Happy New Year when it comes, and all the best for 2018. Nollaig Chridheil agus Bliadhna Mhath Ur dhuibh uile. Over the past few months, I have been monitoring the visitor statistics on the Kishorn Online website. Its shows the most viewed pages are the Bealach na Ba, Kishorn Port and Places to Stay pages. The blog is fourth. The Bealach na Ba. One of the highest mountain roads in Britain, and the one with the steepest ascent and descent. A road that has spectacular views, and an amazingly engineered road way with stone walled supports and hairpin bends. A road some may argue was never built to accommodate the amount of traffic it does today. But I can’t help thinking that not enough is done to draw attention to the pass as a roadway which was, and still is, vital for communities in the Applecross peninsula as a lifeline link and not just a ‘drive by attraction’. A roadway which was constructed as a cattle track (hence Bealach na Ba, which translates from Gaelic as ‘Pass of the Cattle’) in order for farmers and crofters to drive (walking and herding drive, not in a vehicle!) their livestock to the Dingwall markets. What a mammoth task, a task that was no doubt undertaken in all types of weather. Places to stay, be it in a local hotel or a B&B. We are lucky to have many accommodation options in the area, and the fact that this is one of the top searches on the website proves that people really are flocking to the area! I follow the tourism debate on Skye with interest, and one of their main problems is the lack of accommodation on the island. But I was reading that ‘Jans’ in Portree are pushing forward with plans, designed around shipping containers, for accommodation ‘pods’ which are compact yet suited to an overnight stay with the essentials provided in a tiny house form. It is somewhere in between glamping and a self catering house. When the media twisted the words of the local police force who apparently said that the island was ‘full’, there was a public outcry to make sure the world knew that Skye was indeed open for business. What should of been reported in the media was that accommodation is booked up and you can’t turn up without booking anywhere and expect to find accommodation. Debate has started again about the state of the Achnashellach road. The road is ‘in the care’ of the Highland Council. The Scottish Government have nothing to do with the road, apart from support from our MSPs for a new road. If the road was a trunk road, such as the Uig – Inverness – Fort William road, then the issue would be a Government issue. But the Achnashellach road is not a trunk road and is therefore the responsibility of the Highland Council. It is an issue which is also related to the Stromeferry Bypass; there are hopes that by making the bypass a trunk road, there is more chance of getting funding and a shorter timescale for a replacement option. Funding from the EU is probably not an option now, and it isn’t until you realise how many of the roads around the area were built with EU funding that you start to loose hope for there ever being enough money to complete these projects. The massive double tracking project on the Kishorn side of the Kishorn Hill was funded with EU money. I remember the road before the project, and the narrow single track road that really did cling on to the side of hill with only a small stone wall between the edge and the tarmac. The new road is over ten years old… I cannot imagine the current volume of traffic being squeezed onto the old road! Several road refurbishment and widening projects between Torridon and Gairloch were carried out using EU funding. The new road between Strathcarron and Coulags was funded with EU money. I think we can say goodbye to EU money ever funding our road projects again. No hope for the Achnashellach road. I read an article about the revised plans for the Parliamentary Constituency boundaries… and you have got to wonder who it is that is putting these plans together! The latest plans are to abolish our Westminster Government constituency, currently called Ross, Skye and Lochaber, and replace it with a Highland South constituency. This means that we will be in a massive area, which stretches from Applecross to Mallaig and across to East coast places such as Grantown on Spey. A massive distance. Isn’t it interesting how one of the biggest constituencies in the whole of the UK is being made even bigger when problems already exist..? Would we see an increase in the number of MPs representing our area? Probably not. Because apparently in the Scottish Highlands we get pushed to the back and forgotten about. This re-design will affect other areas too… to such an extent that should these plans go ahead, just three MPs will represent 40% of Scotlands total landmass and we are included in that. Getting everyones voices heard? More like forgetting we even exist. You can comment on these plans by visiting http://www.bcs2018.org.uk. The Selfie Box has continued to be very popular with the visitor book now full of messages. Thank you for all your comments and good wishes! The Selfie Box will soon be going into ‘winter mode’ and only the basic displays will remain. In case of internal or external damage during periods of severe weather, I will close the selfie box until the weather improves. The box has stood for many decades, but now it is the Selfie Box I want to make sure it remains in good condition. Apart from this, it will be open all winter! Our local businesses will soon start to open on reduced opening hours as everyone takes a break (and a sigh of relief?!) as the area starts to quieten down. It has been a very busy season again this year. You can keep up to date with all the opening hours for the Seafood Bar, Patterns of Light gift shop and Bealach Cafe on the Kishorn Online website. The temperature is definitely going down and no doubt we will see snow on the Bealach in the not too distant future. Because Winter (and dare I say it, Christmas!) really is just around the corner! It&apos;s been a while since I have written a blog post… it has been a very busy few months! There seems to be a silence being shown towards finding a replacement to the Stromeferry Bypass. The council are not keeping us regularly updated. It is not clear if we are any closer to getting a bypass, for the bypass. Last I heard, there were three different options shortlisted: a bridge, a new Glen Udalain road, and a road-on-rail tramway. If the tramway solution is chosen as the preferred option, then that will absolutely be a case of money over anything else, including the lives of the people who use it. You might think that &apos;peoples lives are at risk&apos; is a bit over the top, but who can predict when the rock face will collapse next? The UK and Scottish Government in particular seem to lack interest or support to help the Council fast forward these plans. I am constantly hearing the &apos;trunk road&apos; excuse being thrown around (because the Bypass is not a trunk road, it is the responsibility of the local authority). Putting off and trying to delegate the problem is just not acceptable. Even forgetting the rockfall risk, the road is narrow with several blind corners and is no longer fit for purpose for the amount of traffic using it. Despite the weather, the Highland Games were a success. It is fantastic that all the volunteers are willing to give up their time and bring the community together. Lochcarron has a reputation (and official title) as being "The Friendly Games" and this is all thanks to the hard work put in by the volunteers. The creation of a speed limit through Kishorn has been brought to the attention of the community and it seems that there is a desire to have a 40mph limit introduced through the main village. I believe that the community council are currently investigating this further so watch this space. I am grateful to already have the verbal support of local residents and business owners and once we know which direction we have to head in, we can start this process. I have noticed though, in doing some internet research, that in England and Wales there is actually a Government website which enables you to request speed limit changes and this is then brought immediately to the attention of the Government/local council. This service seems to be non-existent in Scotland and the changing of a speed limit seems to be more complex. 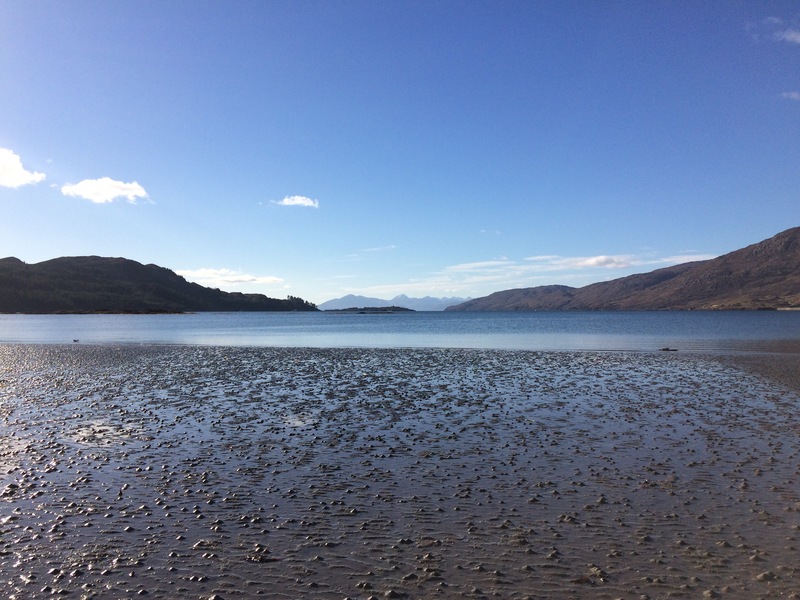 Over the past few months, we have seen a rare seabed destroyed at Loch Carron and people were up in arms about it. Now I don&apos;t agree with scallop dredging. But there has been a massive failing in the protection of this reef. If this reef is as important as people say it is, and people already knew it was there, why has an exclusion zone not already been placed around it? Why has it only now been given official protection status, when it has been destroyed? I am however concerned to see that dredging continues in Loch Kishorn and Loch Carron. It really does anger you to see the dredging boats skirting the edge of the new exclusion zone and &apos;pushing their luck&apos;. At the same time, these boats need to make a living and have to use all the available ground they can get. Instead of turning against the scallop dredging, we need to work with them. At the end of the day, whether the scallop dredger knew the reef was there or not, there has been a massive failing in the protection of this reef. And I have not seen or heard anyone point the finger of blame to the marine protection bodies. On Saturday the 29th July, the village said goodbye to Viv and Lisa Rollo, who have owned and run the award winning Kishorn Seafood Bar for over 20 years. Before that, the first Kishorn Seafood Bar was opened by Viv in the old fuel station building opposite the shop. When that building was demolished, the current unique premises were built and the Seafood Bar has remained there ever since. The Seafood Bar has very much helped to keep Kishorn on the map, and is known not just in Scotland, the UK or Europe. It is known across the world. And that is thanks to Viv Rollo, and her daughter Lisa. I would like to wish them both the very best for the future and also send my good wishes to the owner, who takes over on the 1st August. Despite its size, Kishorn has a lot to offer. It has a vast history too (not just about oilrigs!). I found an old postcard of Kishorn… maybe it is time for some new ones! Not only would people be able to visit Kishorn; they would be able to take away a bit of it too. Work has begun to bring the Kishorn drydock, previously used to build the largest manmade moveable object in world, back to working life. Things have progressed quickly since I wrote my last blog. 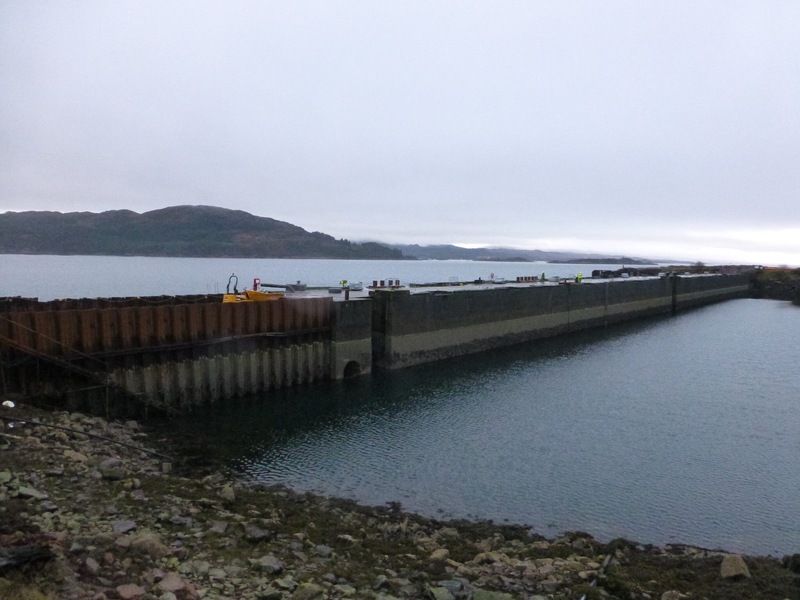 In 2013, Kishorn Port Ltd were given the go-ahead to turn the drydock and surrounding area into a renewable energy hub. 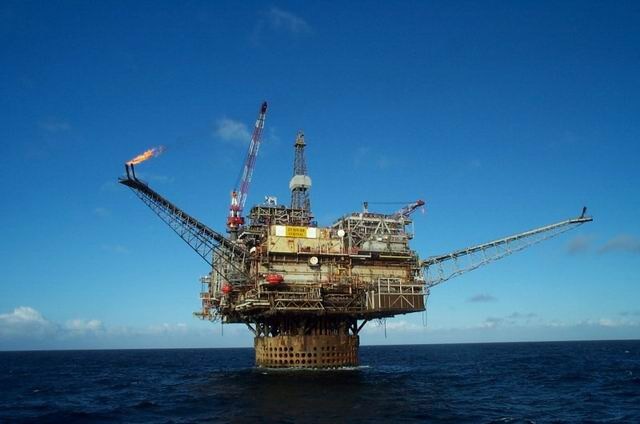 The plans also detailed the potential for oilrigs to be de-commissioned on the site. This year, the port was given half a million pounds to start work on the drydock. The gates will be undergo an overhaul and the water in the dry dock will be pumped out to test the new water seals on the gates. The gates will then be removed and re-instated to test how well the system works; the gates have sat idle for many years! It will be the first time the drydock has been operational (and dry!) since 1992 when the support ‘cassions’ for the legs of the Skye Bridge were built there. 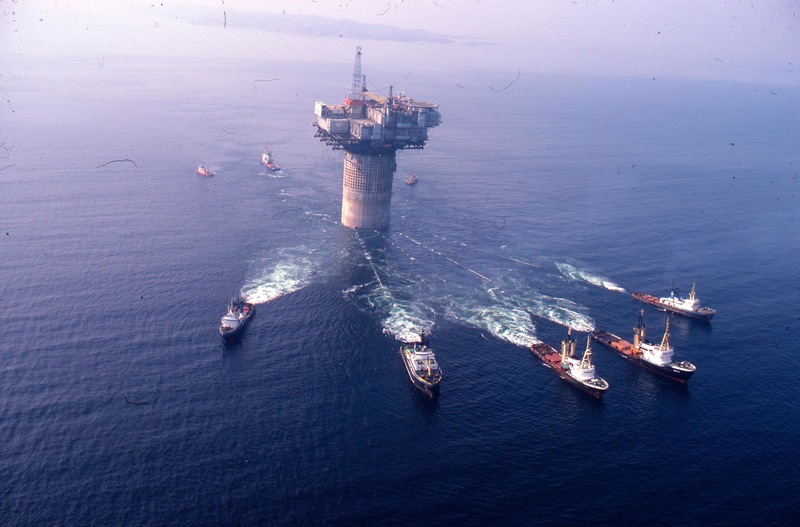 It is almost 40 years since the Ninian Central Oil Platform was constructed there in 1978. 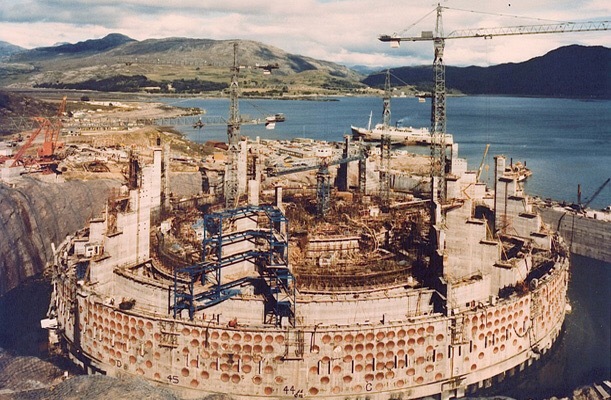 The 600,000 tonne platform was, and still is, one of the largest man-made moveable objects ever created. She is still being used today. She is anchored at the Ninian Oil Field, around 144km North East of Shetland. The oil is transported from the platforms to the Sullom Voe Terminal in Shetland via the Ninian Pipeline System. It is with some disappointment to report that, after speculation for many months, the playpark at Achintraid has now been removed. Plans are afoot for the now un-used land which could involve a community project to re-instate new play equipment. Watch this space..! Resurfacing work between Kishorn and Lochcarron has now been completed. The stretch of single track road between Kishorn and the Glenmor cattle grid has been resurfaced and the verges have been cleared. The work to improve this stretch of road is welcome, it’s a shame that the machines didn’t stay to do the whole Lochcarron road! I wonder how long it will before it is all double-track. It was only around 15 years ago that the A896 Kishorn – Lochcarron route received its first section of double-track when major works on the Kishorn Hill were completed; the end of pulling into the tight passing places teetering on the edge of the hill! Slowly over the years more sections have been upgraded. I’m working to get the Selfie Box out of ‘Winter Mode’ and ready for the season ahead! I’ve started to clear the mud, grass and rocks from around the Selfie Box too and hope that, once the ground dries, I can improve the surrounding ground to make the Selfie Box stand out even more. As well as the Facebook page you can now post your selfie onto the new Instagram page: @kishornselfiebox . Patterns of Light is now open on summer hours, and the Kishorn Seafood Bar is just a few weeks off opening for the season. The Bealach Cafe remains on winter hours, but will soon welcome customers for the whole week once the season gets underway. In my next blog, I will update you on all the opening hours for our fantastic local establishments! The warmer weather also means that lambs and young animals will soon start to appear in the local fields. Can I politely remind dog owners in particular to keep your dogs under supervision if out and about, and please do not let your pet(s) wander freely into areas where young livestock may be grazing. Thank you. The Highland Council elections will be held on the 4th May. The polling station (for Kishorn residents) is at Lochcarron Village Hall. Can I encourage you all to go to the polling stations and use your vote. A spoilt paper is so much better than no paper at all. You will be able to follow information about the elections and our local candidates in my next blog, on the Kishorn Online website and also on the Kishorn Facebook page. It has been interesting to note the continued installation of the Superfast broadband cable in the village. However, Achintraid looks set to miss out. I haven’t heard any official report from BT, but apparently the ‘outputs’ (ie the signal to your house) only reach to a certain distance of the green box stations (that have now been erected). Achintraid is not in the allocated distance, which from what I have heard is less than a mile. Doing it all on the cheap it seems. While all the machines and workforce are in the area they might as well install these green box stations at Achintraid too. Achintraid isn’t having the best of luck in terms of improving broadband and phone signal. The EE mobile phone mast has now been granted planning permission, but its position means that most of the village will see no difference in coverage! People moan and go on about how dependant we are now on phones and internet. But times are changing, the world as a whole is now dependent on it. It is so important that the remoter areas of the Highlands and Islands are kept up to date with the new technology. We must not be forgotten.